Winter campaigns [Зимові походи; zymovi pohody]. Offensives of the Army of the Ukrainian National Republic behind the lines of the Volunteer Army and Red Army in 1919–20 and 1921. The First Winter Campaign lasted from 6 December 1919 to 6 May 1920. As conventional military action in the Ukrainian-Soviet War, 1917–21, became impossible, the Ukrainian National Republic government decided to demobilize those units unfit for battle and to send its battle-ready troops behind enemy lines to conduct partisan warfare until it could set up a regular front. The participating UNR troops were commanded by Gen Mykhailo Omelianovych-Pavlenko. His assistant was Gen Yurii Tiutiunnyk, and his chief of staff was Col Andrii Dolud. Permanent political officers were assigned to the army to maintain liaison among the government, the troops, and the civilian population. 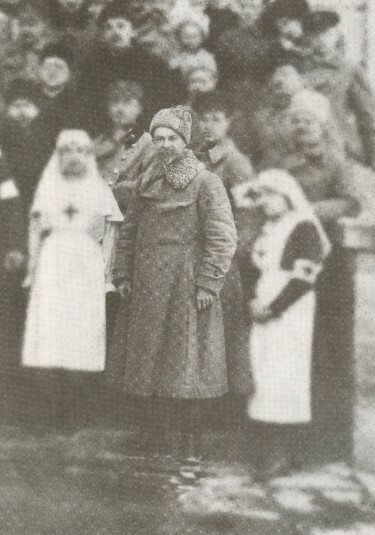 Prime Minister Isaak Mazepa kept in touch with the army and even accompanied it for a while. The combat troops consisted of the following groups (renamed divisions in February 1920): Zaporizhia (commanded by Gen Andrii Huly-Hulenko), formed from the remnants of the Zaporozhian Corps; Kyiv (commanded by Gen Tiutiunnyk), formed from the remaining troops of the Sich Riflemen; and Volhynia (commanded by Gen Oleksander Zahrodsky). At first the units operated in the Yelysavethrad region between the Red Army and Anton Denikin's forces. When the Bolshevik-Denikin front moved southward, the Ukrainian units penetrated east behind the Bolshevik lines, and in February 1920 they crossed the Dnieper River into the Zolotonosha region. 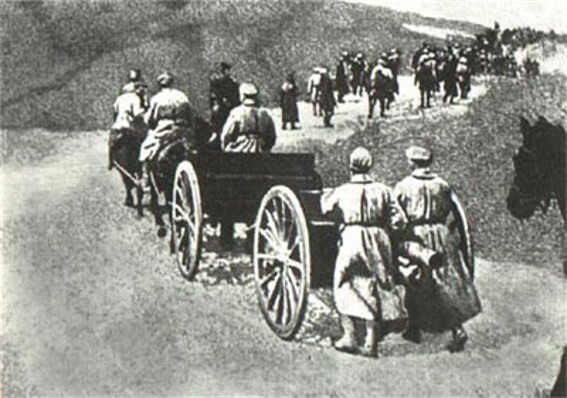 In April the raiding army fought its way back to the Ukrainian forces on the Polish-Bolshevik front, which it reached finally on 6 May in the vicinity of Yampil. The participants in the First Winter Campaign marched almost 2,500 km and fought for the following locations: Lypovets, Zhashkiv, Uman, Kaniv, Cherkasy, Smila, Zolotonosha, Olviopil, Holovanivske, Haisyn, Voznesenske (capturing major items from the 14th Soviet Army), Ananiv, and Balta. Estimates of the number of officers and men who took part in the campaign range from 3,000 to 6,000. The Second Winter Campaign (also known as the Ice Campaign or the November Raid) took place in November 1921, while the Ukrainian National Republic government and its disarmed army were in Poland, and the partisan movement was still active in Ukraine (see Partisan movement in Ukraine, 1918–22). The goal of the raid behind the Bolshevik lines was quite bold: to unify the partisan operations and to sweep the Soviet regime from Ukraine. Detachments of volunteers from the interned soldiers of the UNR Army in Poland formed what was called the Ukrainian Insurgent Army. It was commanded by Gen Yurii Tiutiunnyk, and its chief of staff was Col Yurii Otmarshtain. The main Volhynia group (800 men) was commanded by Gen Tiutiunnyk, and the Podilian group (400 men), by Lt Col M. Palii and, later, Col S. Chorny. Gen Andrii Huly-Hulenko's Bessarabia group did not undertake any serious operations and after a few days returned from Ukraine to Romanian territory. The men in all the groups were poorly armed and clothed. The Podilian group set out on 25 October and fought its way through Podilia, where it crushed a Soviet cavalry regiment and transformed itself into a cavalry group. It reached the village of Vakhnivka, 60 km north of Kyiv, and then returned through Volhynia, to cross the Polish border on 29 November. The Volhynia group set out on 4 November and captured Korosten on 7 November but was unable to defend it. The group then moved as far east as the village of Leontivka. Having lost any hope of meeting with the Polisia group and replenishing supplies, it turned west. During the return march it was encircled by Hryhorii Kotovsky's cavalry near the town of Bazar, in the Zhytomyr region. Many of its men were killed in battle at Mali Mynky on 17 November, but the majority (443) were captured: 359 of them were executed at Bazar on 23 November, and the rest (84) were handed over to Bolshevik police. Only 120 men and the staff broke out of the encirclement, and they had fought their way to the Polish border by 20 November. The Second Campaign was the last operation of the Army of the Ukrainian National Republic against the Bolshevik forces occupying Ukraine.